I first shared this recipe on Spend with Pennies where I was a contributor. 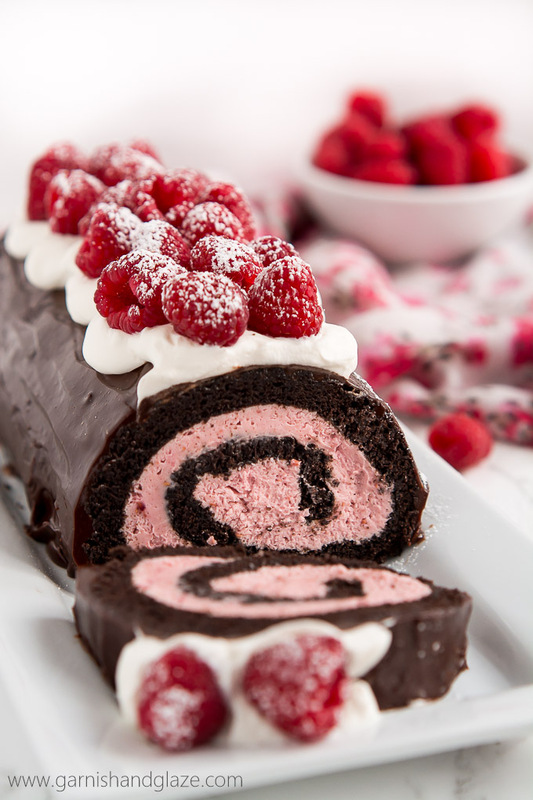 With raspberry cream filling, chocolate ganache, whipped cream, and fresh berries, this Raspberry Chocolate Swiss Roll is sure to make your Valentine swoon. Valentine’s Day is coming up! Do you have a special someone? 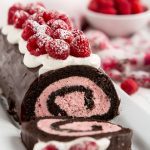 Well, even if you don’t have a significant other, you probably have a family and friends and surely they would appreciate this decedent Raspberry Chocolate Swiss Roll. Or if you really have no one then you will most definitely want this. 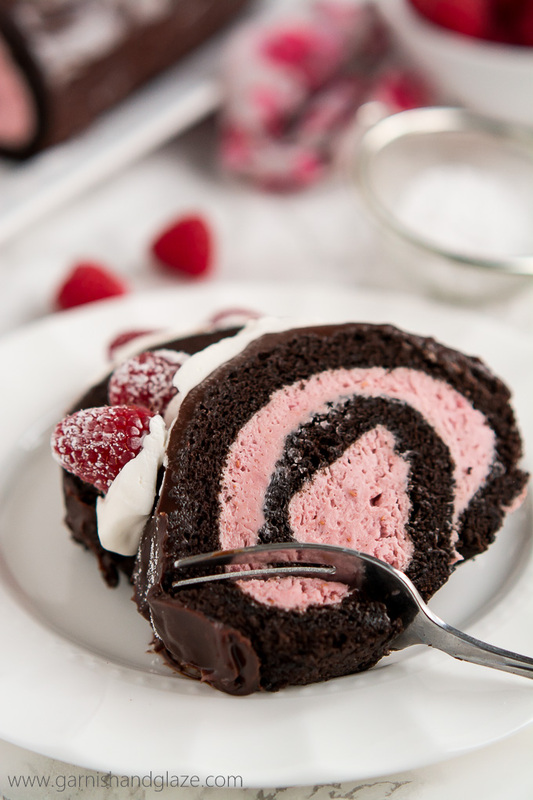 Sure cake rolls look gorgeous like they’d be super complicated to make but it’s actually quite easy. The cake is a sponge cake so it can easily be rolled without falling apart. Did you know a sponge cake doesn’t have butter or oil? So crazy that such a cake exists! And by some miracle this cake is still so yummy and moist. The reason the cake doesn’t fall to crumbles when you start rolling it is because of all the eggs whites. You whip 4 eggs whites until they form stiff peaks and then you mix in the chocolate batter. Pour it into a large jelly roll pan lined with parchment paper, bake, and voila- “sponge”. Immediately turn the cake out onto a towel heavily coated in powdered sugar (this is so it doesn’t stick). Then you roll the cake up in the towel, starting at the short side. 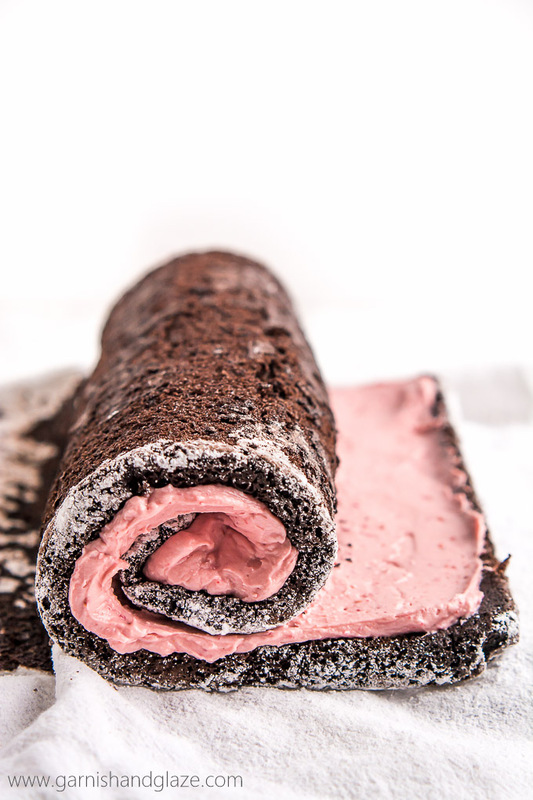 Let it cool completely and then you unroll it and spread the amazing raspberry cream filling on. As much as I love the raspberry frosting in my Raspberry Chocolate Cupcakes, it doesn’t have as many raspberries as I’d like because it starts to get too thin the more you add. To get an intense raspberry flavor and still retain that perfect smooth texture you’ve gotta use freeze dried raspberries. Just blend them to a fine powder and add it to your frosting. Ta-da! Naturally flavored and colored! So so good! You can get them at Amazon or Trader Joe’s. Once you spread the filling on, roll the cake right back up. Cover it with plastic wrap and place it in the fridge to allow the filling firm up. You can serve it sprinkled with powdered sugar or you can go all out and top it with the ganache, whipped cream, and fresh berries. Serve immediately or refrigerate until ready to plate. 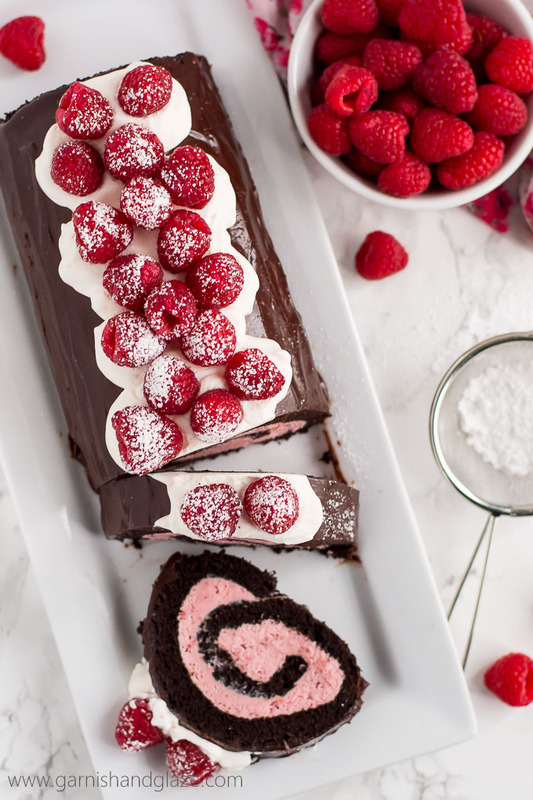 This moist chocolate cake with a strong raspberry cream filling, rich chocolate ganache, whipped cream, and fresh raspberries is the most perfect dessert and will have everyone begging for more. Preheat oven to 350 degrees F(325 if using a dark pan). Line a 10x15 inch jell roll pan with parchment paper and grease with cooking spray. In a mixing bowl, use an electric hand mixer to beat egg whites until soft peaks (peaks fall when you lift the beaters). While mixing, slowly add in the the 1/2 cup sugar and beat until stiff peaks. 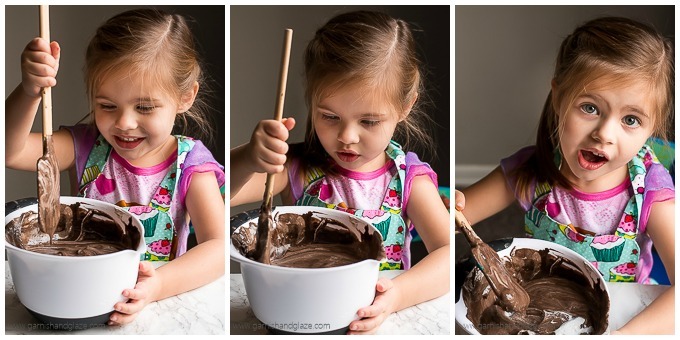 In another mixing bowl, mix flour, cocoa powder, baking powder, baking soda, and salt together. Alternately add flour mix and the 1/3 cup water to the egg yolks. 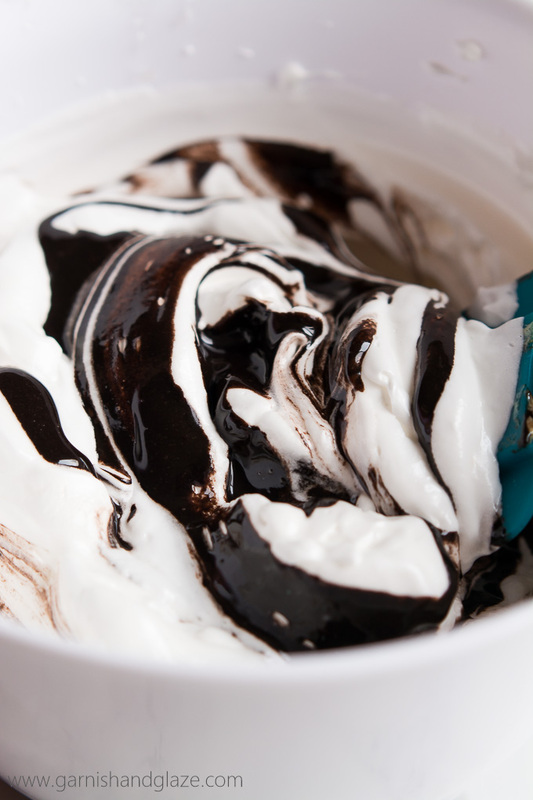 When thoroughly mixed (scrape down sides of bowl), fold the chocolate batter into the egg whites a little at a time. Spread batter into the prepared baking pan and bake for 12-15 minutes until toothpick come back clean and cake springs back when lightly touched. Fold in 1 1/2 cups of the whipped cream until combined and place the remaining whipped cream the the fridge to use as a garnish on top (you may need to whip with a whisk if it loses stiffness). 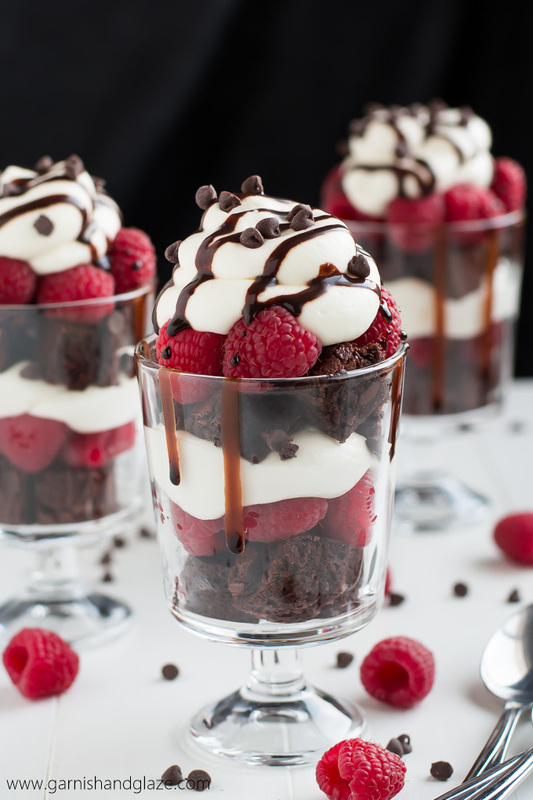 Heat the 6 tablespoons whipping cream in microwave for 45 seconds or until hot and then add the chocolate chips. Cover and let it sit for two minutes and then stir until smooth. Let the ganache come to room temperature (about 5-10 minutes) before pouring and spreading over the cake. 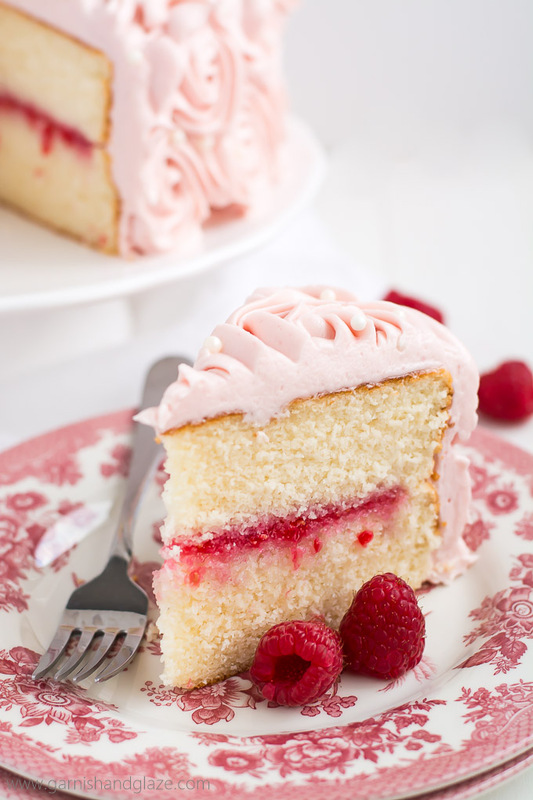 This looks like the dreamiest, most delicious thing I’ve ever seen! I need to make this soon! Haha! Thank you Paige! You’ll love it! 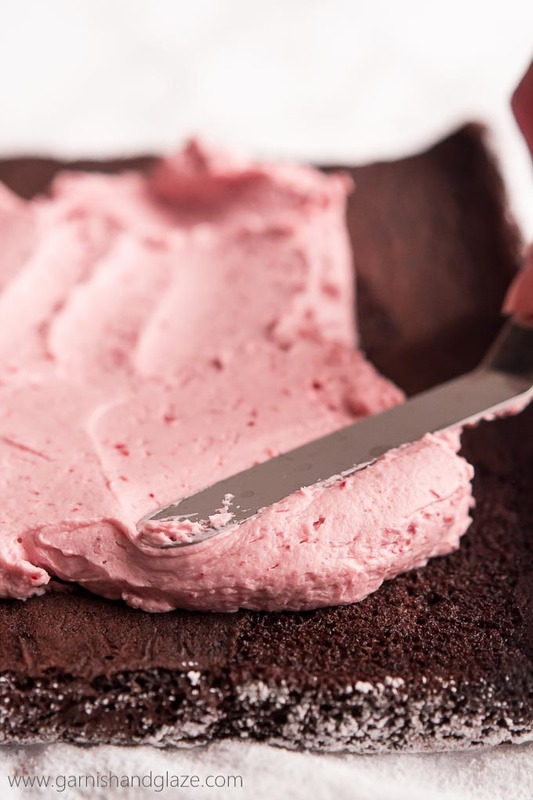 Best raspberry chocolate cake! So GORGEOUS!! I have yet to make a cake roll! Love this and I have to agree that this would be perfect for Valentine’s Day! Thank you Malinda! Make this one! Cake rolls really aren’t that difficult and they are so good! I am having the most difficult time find freeze dried raspberries. Where could I purchase them? Katelyn, I buy them at Trader Joes but if you don’t have one you can order them on Amazon (here). How much of this can be done like a day ahead of time? Everything except the garnish of cream and berries? Yes! You can put the cream on about 2-3 hours early but any earlier and it will lose it’s form. Thank you! I made this for Valentine’s Day, WOW it was fabulous. Tasted divine and looked just like the picture. I don’t know where I went wrong but when I mixed the dry ingredients gradually with the yolk and water, it was just very stiff and grainy. Then when I folded it into the egg whites it just didn’t mix right. I just pulled it out of the oven and it’s ruined. Any idea where I went wrong? That’s really strange. Did you beat the egg yolks as specified in the recipe? Did you spoon your flour into the measuring cup and then level off with a knife? Maybe you had too much flour. If you followed everything else it’s hard to know where you went wrong without me being there. Whose recipe is as I see the exact recipe and picture on another site? I created this recipe. I was a contributor for Spend with Pennies a year ago and I first shared it there on her site.